Speed Engineering True Dual Exhaust Kits!! I think that kind of sounds like **** but that's just my .02. I do think this is one hell of a deal because you change the mufflers many times over and still be ahead. I bet a bolt on car would sound much better. I think my Borla sounds like **** but it makes great power and that's the main importance. Here ur pics man. For those all this is on a pro kit. Tucks up nice and like almost all system its the driver side pipe is the lowest in the system but a lot better than some of the other exhaust I have seen. That looks like it tucks up nicely! Should be even a little better with the strains. Do you have any rubbing or banging? Did you have to cut or remove the tank heat shield? No rubbing or banging this far. 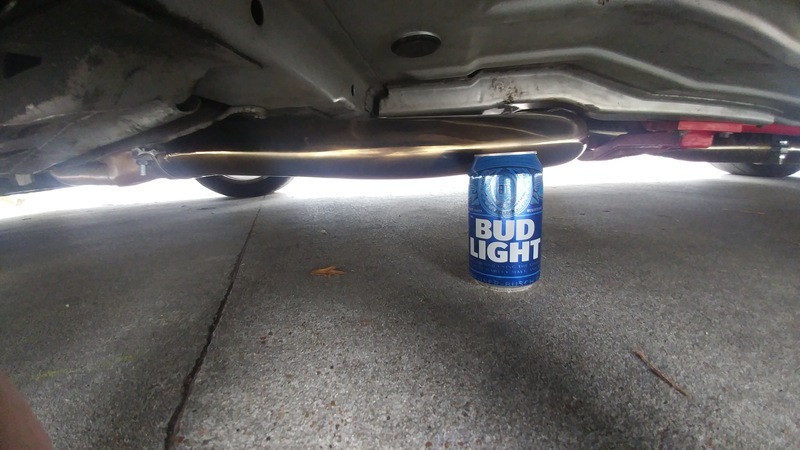 I had already removed my rear heat shield a long time ago so I really can't comment on that. Looks to be a great system at a killer deal. 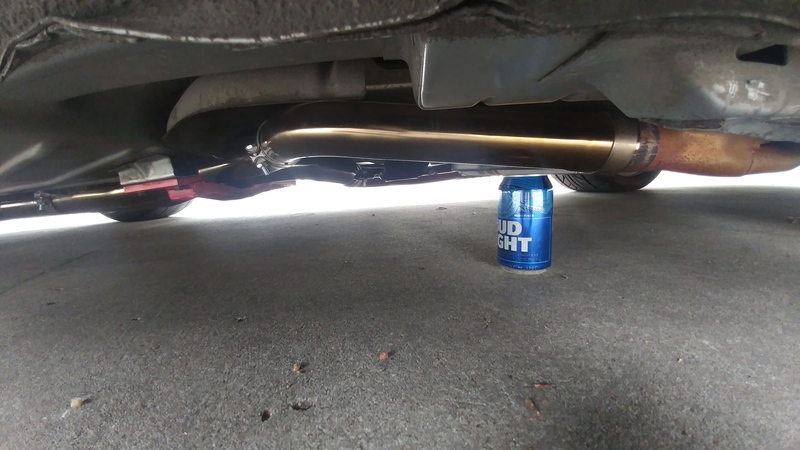 You can always change the mufflers if you don't like them. It's not a big deal! I may put this on my drag car. 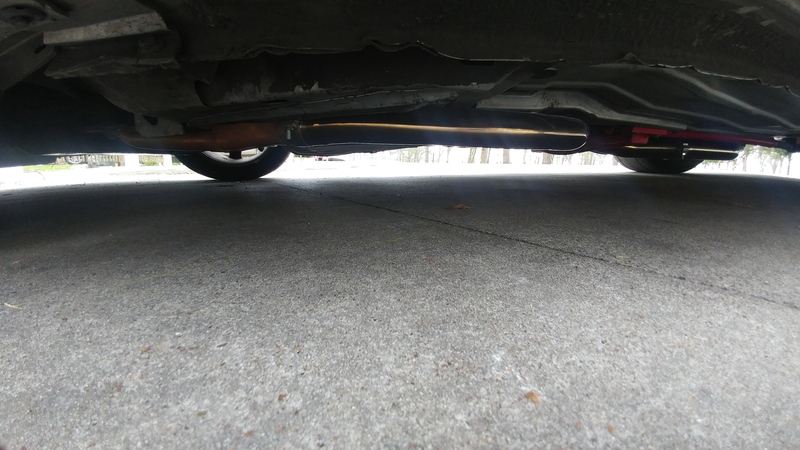 Can you take a few pictures underneath where larger mufflers could go? Is there any other place where a couple of bullet mufflers could go? I worked on my car all day yesterday.Getting the old system off was some what of a pain in the ***. For some reason I can't get the SLP headers to slid down pass the motor. I'll have it done this week tho. Ugh. This is how I wanted my car to sound when I made my true duals. I put pypes m80 mufflers on and its so quiet I have to get on it to kinda hear it. Everyone tells me its extremely loud, but not inside the car where I wanna hear it. Yeah wasn't too hard, hardest part was getting the xpipe in because of my tunnel mount. Looks great. Are you running a MWC tunnel mount? I currently have one but I'm running the crossmember for true duals that goes under the crossmember so I'd probably have to change that out. No I have umi chassis mounted torque arm. I got a th400 with 3.73 gears so I really couldn't tell you bow it would sound with o/d but at 3k at 60ish its not bad at all. Priced at around $500 and put it on eBay so I can use their global shipping.. i'll buy one straight away ! I wonder how difficult this will be to mate to a CME? And I like quiet, currently on a 1-7/8" catless SLP dual/dual setup and that it a good tone. Should just be able to remove the tips and fab a 90* inward on both sides and connect to the CME tips. Seems like it would be fairly simple. Thank you guys for all the comments, pics/videos, and orders. I bought the rear exit kit and have had a few issues, which is almost to be expected when it comes from China. My package did not contain the passenger side exhaust tip, packing list of materials, or clamps that are worth your time. Speed Engineering will, hopefully, replace the missing tip and I am buying 9 stainless band clamps to replace the junk pieces in the kit. As mentioned earlier in the thread, you will need to grind down the washer for the rear-most hangar brackets to fit. On the bright side, it sounded pretty good for the 50ft I drove it out the door of the shop. Quick Reply: Speed Engineering True Dual Exhaust Kits! !